The present Tuxford Hall was built in the late 18th century by the White family of Tuxford and Wallingwells. The entrance façade is typically Georgian in appearance but the pretty garden front is quite unexpected and has two large bowed bays in the Gothick style. 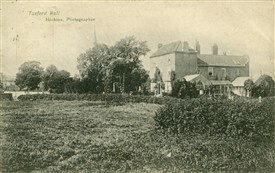 The hall occupies the site of the White’s old manor house, which according to ‘Some Account of the Family of White of Tuxford and Wallingwells’, by Miss M H Towry White, 1886, had been used as a dower house until it fell into disrepair. Much of the Tuxford estate was sold to the Duke of Newcastle in 1820 but an estate map of c1820-1830 (held in Manuscripts and Special Collections, The University of Nottingham) shows that the White family retained ownership of the hall after the death of Sir Thomas Woollaston White in 1817. His widow, Lady Elizabeth White, lived there probably until her death in 1850. Nottinghamshire directories tell us that John Bygate, a horse dealer, resided there in 1864. By 1869, a very busy George Andrews is listed as the occupier. He’s described as “farmer, maltster, corn, coal, seed and tillage merchant, and agent to the Royal Farmers’ and Accidental Insurance Offices”. The most interesting occupier was certainly Mr Robert Stretton Wilson, a veterinary surgeon and farmer with a passion for collecting, who lived at the hall from at least 1876 until his death. 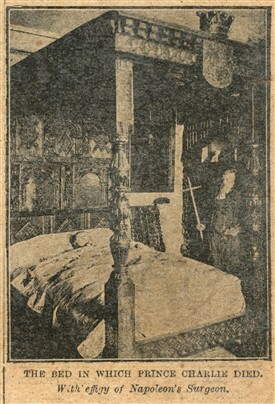 Charles F. Shaw’s article “A Gentleman who claims to have tamed the devil” for the journal The Golden Penny (May 4th 1901), describes Mr Wilson as “an enthusiastic archaeologist and art collector, his house, a roomy, well-built mansion occupying a commanding position in the centre of pleasant grounds, is literally packed from basement to ceiling with treasures of art, archaeological remains, and valuable curios from all corners of the world.” He goes on to describe some of the curios, “There are giant pea-pods from New Zealand, kangaroos from Australia….primitive pottery found on the Lincolnshire fens, relics from York Minster, exquisite lace work from Welbeck Abbey, articles worn by Prince Charles, a vase presented to the Duke of Newcastle by the Emperor Nicholas, Lord Byron’s bed and table from Newstead, the bed on which Prince Charles slept, Lord Nelson’s sword, hat worn by Wellington on the field of Waterloo, Roman urns and weapons, vases used by the monks of Bolton Abbey, church brasses recording the deaths of Wickcliffe and other famous men, with models of every celebrity of every age from the giant Goliath to the Iron Duke to the surgeon who attended Napoleon I. In fact it is impossible to mention one-half of the valuable relics and wonderful curios collected by this extraordinary man at his wonderful home.” The article included some fascinating photographs and they are reproduced here. 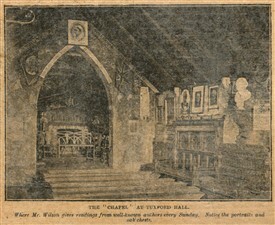 It would appear that word of Mr Wilson’s collection had spread prior to the publication of Mr Shaw’s article because the Nottinghamshire Guardian of 12 February 1898 reports that seven young men from Retford called at Tuxford Hall on Sunday 30th January and asked Mr Wilson to let them see his curios. They were admitted and unfortunately one of the men, a groom called George Chapman, stole a small book of proverbs and a bronze medallion from the chimney piece. He was subsequently caught, charged with theft, and fined £1. He blamed drink for his actions and apologised. 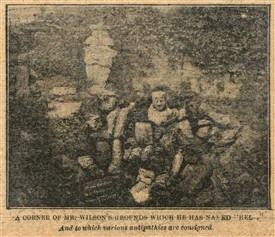 As if the house wasn’t unique enough, Mr Wilson turned his attentions to the grounds too, where he created his very own version of “Hell”. The entrance to this inferno (actually a shallow pit) was guarded by large statue of Satan, bound in chains, holding a skull, and grinning up at the nearby church spire (interestingly, Mr Wilson had fallen out with the local vicar, who refused to make him a church warden, so he built himself a private chapel inside Tuxford Hall, from where he gave readings on Sundays). Mr Wilson cast into this hellish pit all the persons and vices he disliked, such as “the Tobacco Devil”, “King Alcohol”, “The woman with the proud look and the lying tongue”, “The person with the hard heart”, “Liars”, “Thieves”, and “Murderers”. An early 20th century postcard (published by Davages of Newark) shows the pit looking rather crowded! We know from other newspaper reports that the auctioneer of the two-day sale, Mr Kidd, tried to hurry the bidders along so that he could move on to the most exciting part of the sale – the contents of the hellish pit in the grounds. When the moment finally came, Mr Kidd took off his top hat and bowed to the effigy of Satan (which, by the way, was sold to a local bidder for 30s). Bidding for the figures in the pit was a little slow and Mr Kidd tried to encourage the crowd by suggesting that the successful purchaser could “show his treasures from hell in music-halls.” The contents of the pit finally achieved £2 10s but unfortunately, we do not know what the new owner (a Newark resident) did with his unusual acquisitions. And so ended a remarkable chapter in Tuxford Hall’s history. 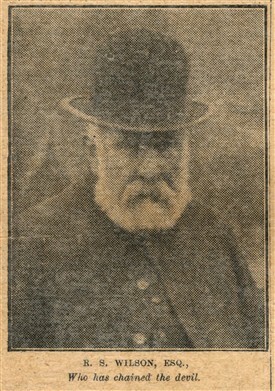 Mr Wilson’s grandson, William Robert Wilson, a colliery manager, resided at the hall in 1911, possibly with his mother (Mr Wilson’s daughter-in-law). She is probably the “Mrs Wilson” of Tuxford Hall mentioned in the Nottinghamshire directories for 1908 and 1912. Subsequent residents (with key dates taken from Kelly’s Nottinghamshire directories, and telephone books) were: Peter Bruce Whitington, surgeon and registrar (1916-1922), Douglas Clark (1925), W.E. Jones (1928), Humbert Arthur D. Cherry Downs (1936), Mrs G.I. Whitington (1941), and J.G. Tait (1949-1955). An advertisement in Country Life magazine records that Mr Tait put the hall up for sale in 1955 as he was “leaving the district”. The hall was purchased by the National Coal Board (possibly from Mr Tait), who used it to house senior staff. They put it up for sale in 1964 (according to a local newspaper report). Tuxford Hall was for sale again in 2012, with a guide price of £650,000. Looking at the photographs in the sale brochure of an up-to-date, attractively decorated residence, it’s hard to imagine that it was once filled to the brim with Robert Stretton Wilson’s extraordinary treasures. This page was added by Jayne Amat on 24/03/2015. I am a direct descendant of the White family. Susannah White was my Grandma. I have just read an interesting article about Tuxford Hall on your site. In it the hall is said to have been built by Sir Thomas Woollaston White however some records show that the hall was the home of his wife Elizabeth Blagg prior to their marriage 31 Jan 1801. It may be that this was an earlier building than the current Tuxford Hall. I am trying to trace Elizabeth Blagg's family back before her grandfather John Blagg (1707 - 3 Dec 1766) of East Markham (my 6xgt Grandfather). Elizabeth's father, Thomas , was the older brother of my 5x Gt Grandfather, James.There are a fine set of gravestones to members of the family including John Blagg in the East Markham churchyard. I wonder if anyone is able to help. HI , its wonderful to know your a direct decedent of the white family , I am the current owner , I acquired the property a few years ago , I actually live in Dubai am still working on the house there aren't many relics but there are some tapestry and an original oil painting of lady white that remain. you are more than welcome to have a look am still developing the house and have grounds man working on the huge garden as well as other properties I own. feel free to check it out. How lovely that you are renovating the Hall. If we are coming north we will call in. At present we live in Chichester. My Blagg relatives finally lived in the Ordsall/Worksop area. Susan, thank you so much for posting your comments. I'm glad you found the article interesting. And Dr Andrews, I'm delighted to hear that you are the current owner. You are very fortunate to own such a lovely old house. Robert Stretton Wilson was my Great Grandfather. My mother was Nancy Muriel Wilson, the daughter of William Robert Wilson. i still have some relics of Tuxford Hall, including the sale catalogue. Somewhere!! It was always regarded a travesty that everything was sold very cheaply. i have a pair of plates which say W.R.Wilson, Tuxford Hall. Anyone interested in more information is welcome to get in touch with me. We would very much like to make a copy of the Sale Catalogue for the County (Libraries) collection if you can find it and bring it to one of the Local Studies Librarians (at Mansfield, Southwell or Worksop Library), or to Archives in Nottingham, please Graham! It's great to hear from you. I would love to find out more about your relics and sale catalogue so I have asked the Website Administrator to pass on my email to you. How nice to find such interest I my distant past! I am on holiday at the moment, but will do some searching around when I return next month. I have found the catalogue and lots of other artefacts. Anyone wanting more info, please contact me through ournottinghamshire. would it be possible to have a copy of the sale, or any info on Tuxford e.g. Names, photos,etc, I remember the house when it was the doctors surgery. I used to visit the hall in the mid 1990's and it was very creepy then. My friends lived there. At the side of the house by the the A1, there was an old gravestone in the ground which read "Witch lies here" but the "s" in lies looked more like an "f" as it was in old english style of writing. I always thought the owner of the house had been a witch and had been buried there but now I wonder if it was another one of this guys artefacts taken from elsewhere. There were also jail gates in the back garden with roses growing over them. I recognised these jail gates as being from the jail in the Newcastle Arms cellar. It had missing gates of this size and age. I lived in the 1990's at the Newcastle Arms hotel which had many hidden treasures and rooms of it's own.